Editor's Note: This is the first post in a series on a surge of violence against civilians in Beni territory and increasing tensions between the local populations and the authorities meant to protect them.This post was written by Enough Project intern Jasper Kubasek. During October, November, and December, communities in one sub-region of eastern Democratic Republic of the Congo have suffered a series of horrific killings that has left the civilian population in that sub-region in a state of combined despair, fear, and anger. Congolese government authorities and several media outlets have attributed the violence to the Allied Democratic Forces (ADF), a Ugandan rebel group that has sought refuge in eastern DRC for more than two decades. More than two months after the first attacks, the ADF have yet to claim any responsibility. While there remains a widely-held view that the ADF are playing a part, there are indications that there may be other players involved. Theses indications merit further investigation. Whoever they are, the perpetrators’ sudden and aggressive return to the tactics of the ADF’s infamous past—targeting vulnerable civilian populations—has resulted in a humanitarian tragedy: the massacre of more than 250 women, men, and children throughout Beni territory. To understand the dynamic that characterizes the region today, it is helpful to interpret this chronology of recent events as two necessarily interwoven, but distinct story lines. The first is that of the actual attacks, unrelenting and increasingly violent. The second is that of the escalating tension between the local population, and the government and UN forces who, in spite of promises, have failed to protect many of them. The first four attacks, spanning from the 2rd to the 10th of October, resulted in the deaths of at least three, four, eight, and then nine civilians respectively. In a fifth attack, during the midnight hours between the 15th and 16th, the perpetrators massacred as many as twenty-seven people, including women and children. This doubling of the death toll at last provoked a response from the UN’s peacekeeping mission MONSUCO, which specifies civilian protection as a fundamental pillar of its mandate. Martin Kobler, Special Representative of the UN Secretary-General in the DRC, strongly condemned the attacks and reaffirmed MONUSCO’s support of local and national authorities’ efforts to neutralize the ADF. Many civilians have become increasingly frustrated towards the government and UN. Most social and economic activities in Goma, the capital city of North Kivu, were shut down on Oct. 20th in protest of the violence in Beni and in solidarity with its local population. In the town and territory of Beni, tensions escalated in response to protests. During the night of the 21st, two youths were allegedly killed by a UN-Congolese patrol. The facts are unclear: one source reports that the victims were members of a group that had attacked the patrol with spears, stones, and machetes. Another reports that victims were members of a protest against the authority’s failure to protect the population, and that UN troops began shooting into the crowd. The following day peacekeepers fired live rounds into the air to disperse hundreds of people protesting outside of the MONUSCO headquarters, now escalated because of the two deaths the day before. Deutsche Welle quotes one protester, “MONUSCO is supposed to keep the peace. Why are they turning their guns on the people when we only want peace? We demand that MONUSCO leave immediately.” The same report claims that civilians are buying weapons and forming militias to protect themselves after having lost faith in UN-Congolese efforts. 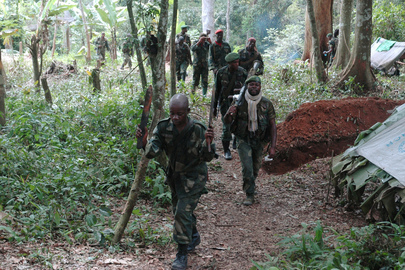 In the wake of these events Julien Paluku, governor of North Kivu, came forward with a worrisome claim that the ADF were intentionally attempting to pit the local population against the forces put in place to protect them, urging that people be wary of disinformation spread by the Ugandan rebels. After renewed protests in Goma were repressed with gun shots and tear gas, President Joseph Kabila traveled to Beni in person during the last week of October in an attempt to calm the situation. Kobler and the UN acknowledged the precarious double dynamic admitting that, “Only action against the ADF, not words,” would serve to revive the population’s confidence in the government forces and in the UN presence in the country as, “no victory is possible without the support of the local population.’” Richard Muyej announced that there would be an increased police presence in Beni. The second post in this series will begin with the last of the October attacks and report on the continued violence and various government responses that followed over the next two months.